Discussion in 'Clash of Clans' started by CoCph, Aug 16, 2015. Because we know how much you love Clash of Clans, we're holding a 2-day CoC tournament in different areas around the country! Put on your game face and get ready to bump heads with other CoC players in the Individual category, or form a group of 10 and go all-out in the Clan category! Event activities are open to all Globe Prepaid customers. Promo will be held from July to September 2015. 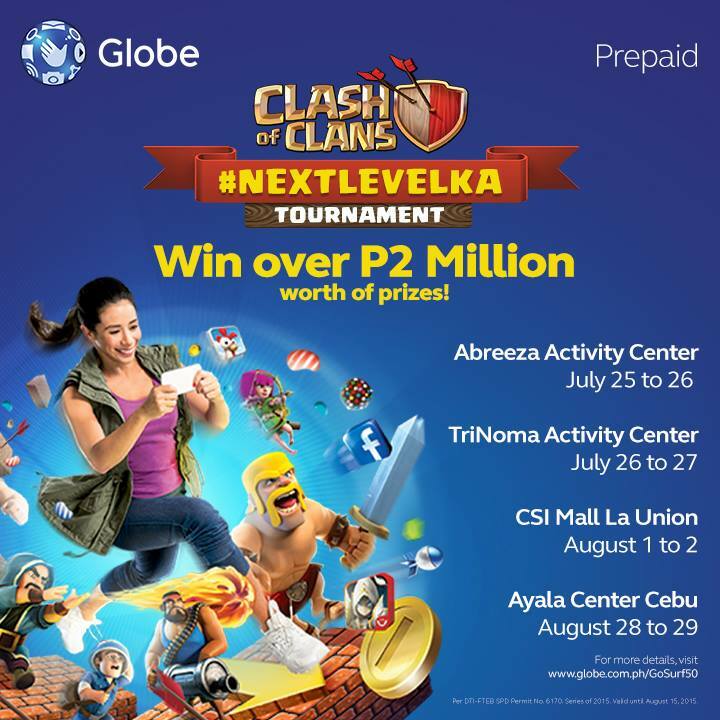 #NextLevelKa CoC Tournament is an online game tournament featuring players in the Philippines who are competing in individual and clan categories. Clash of Clans or CoC is a free game application available on iOS and Android devices where players build their village, train troops, and invade enemy villages to receive trophies, gold, and elixirs needed to upgrade and strengthen their own village. TOWN HALL or TH is defined as the basis for a player's level, upgrades, buildings and troops. Destroying an enemy town hall guarantees the player a star, corresponding trophies and victory over the enemy village. GEMS are the currency of payment for enabling abilities within the game or the purchase of Gold, Elixir or Dark Elixir.These are also used to boost barracks, resources and speed up upgrades. BASE TROPHY is the number of trophies or cups a player has before s/he attacks an enemy village. ENDING TROPHY is the number of trophies or cups a player has after s/he attacks an enemy village. EARNED TROPHIES are the total number of trophies/cups a player has earned after s/he attacks an enemy village. This is computed by subtracting the Base Trophy from the Ending Trophy. There will be more than P2,000,000 worth of cash and gems to be given. Prize will be given onsite after each tournament round. The winners will be announced via www.facebook.com/globeph. #NextLevelKa: Find the hidden codes and win!